Remarkable political satire ridiculing Davy Crockett! The Colonel Electioneering. How to Get a Vote, or Going Fixed for the Purpose. 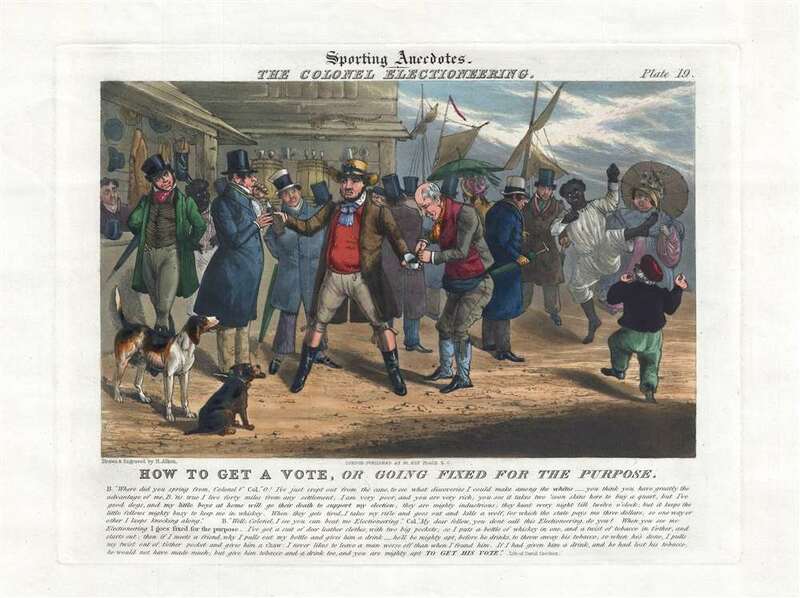 This rare and finely executed c. 1830 - 1835 satirical print illustrates the British perspective on American campaigning or 'Electioneering'. The focus of the print is David 'Davy' Crockett (August 17, 1786 – March 6, 1836), by then already a legendary American figure for his often-exaggerated frontier adventures. Here, Crockett embodies the British perspective on the American politician as an uneducated, tobacco chewing, corrupt drunkard - as well as propagates general British misconceptions about the Americas themselves. The print features Crockett at center, a bottle of whiskey in one hand, and a bag of tobacco in another. Crockett's loyal hounds look on in the foreground. In the near background, a dark-skinned man dances for the amusement over overweight Americans. Behind the crowd, there is a hat store, and a bar with large whiskey barrels, and what appears to be a port scene, with ship's sails and possibly a beach. A stripped cat lounges above the bar. The scene strikes us a far more reminiscent of the West indies than Crockett's Tennessee, which of course, had no sailing ships. When you see me Electioneering, I goes fixed for the purpose. I've got a suit of deer leather clothes with two big pockets; so I puts a bottle of whiskey in one, and a twist of tobacco in t'other, and start out; then if I meets a friend, why I pulls out my bottle and gives him a drink _ he'll be might apt, before he drinks, to throw away his tobacco; so when he's done, I pulls my twist out of t'other pocket and give him a chaw. I never likes to leave a man worse off than when I found him. If I had given him a drink and he had lost hos tobacco, he would have have made much; but give him tobacco and a drink too, and you are mighty apt to get his vote. I told the people of my district that I would serve them as faithfully as I had done; but if not, they might go to hell, and I would go to Texas. One year later, Crockett died in a dramatic last stand while defending the newly formed Republic of Texas against the Mexican armies of Santa Ana. This print was engraved by Henry Thomas Alken and published sometime in the late 1820s or early 1830s in London at 31 Ely Place. It was published as plate 19, part of a series of Alken prints known as 'Sporting Anecdotes.' Today the print is quite rare, with the OCLC identifying only a single example at the Library of Congress. We are aware of 1 other in a private collection. Henry Thomas Alken (October 12, 1784 - April 7, 1851) was a British, painter, engraver, caricaturist, and satirist active in London between 1816 and 1831. Alken was born in Soso, Westminster, the son e of Samuel Alken, another well known artist. He studied painting under his father, and afterwards under the miniaturist John Thomas Barber Beaumont (1774 - 1841). His earliest works were signed under the pseudonym 'Ben Tallyho,' but from about 1816 began publishing under his own name. Most of his work focused on British sporting life, including duck hunting, fox hunting, riding, coaching, etc. However, he was not above political satire often poking fun at the foibles of the aristocracy. Very good. Minor repair bottom margin. Wide clean margins. OCLC 28653932. Library of Congress, PGA - Alken (H.)--Colonel electioneering ... (B size) [PandP].